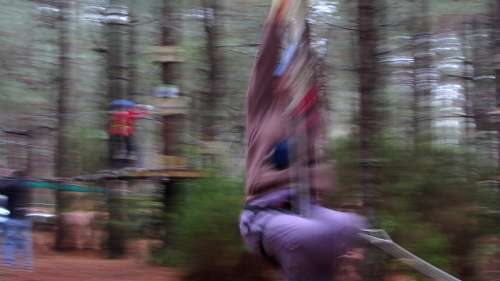 A new adventure playground has opened in Breña Alta, up in the pine forest, quite close to the barbecue site at El Pilar. It’s called ACROPARK, and they have three circuits for different ages and daring, from the kids’ circuit with 13 activities, where you’re never more than a metre off the ground, to the senior one with 20 activities, where you get as much as 7 m up. "And you always, always have at least one of your clips on the lifeline." Whichever circuit you do, you’re provided with a lifeline, and safety clips, so that you can’t possibly fall. The first thing they do, is to take you on the training circuit to show you how to use the safety equipment – always have at least one clip on the lifeline, and if they’re on the same lifeline, have them clipped on in opposite directions, so you can’t accidentally unclip them both at once. They also mention the weight limit for the lifeline – 600kg (roughly 92 stone). And then you do three easy activities to practise. The two easier circuits also provide reasonably photo opportunities from ground level, so you can immortalise the kids’ adventure. A young girl demonstrating the "zip" in "Zip-line"
I haven’t tried the senior circuit yet (but I plan to). The junior circuit was enough to get my adrenaline going. You go across rope bridges, balance on swaying logs (I was reassured by the safety harness), through a rope tunnel, and across zip lines. I had a great time, as did my son, but once poor woman ahead of me had an attack of nerves and couldn’t face the zip line at first. My only problem was a lack of strength in my arms – I need to get a little fitter before tackling the senior route, but I’m really looking forward to it. Me, whizzing down the final slide.